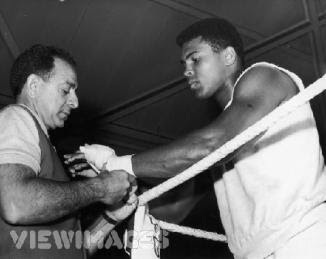 Happy Birthday Angelo Dundee - The Legendary Trainer/Corner-Man Turns 90 Today! 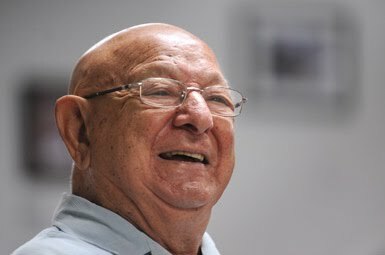 By James Slater: What boxing fan out there has not heard of the legendary Angelo Dundee? Fully deserving of his legendary, even iconic status, the mastermind who guided, most famously, Muhammad Ali, Sugar Ray Leonard, George Foreman (in the latter stages of Foreman’s career) and Michael Nunn, turns 90-years-of age today. Still sharp as a tack according to former World Boxing Association (WBA) heavyweight champ David Haye, who worked with Dundee recently, out at the world famous 5th Street Gym in Miami, Dundee has retained his passion for the sport he has given so much to. It is his work with the two brilliant boxers, Ali and Leonard, that “Angie” will always be remembered most fondly for, however. Who would dispute the contention that Leonard may well have lost that first, amazing fight with Tommy Hearns without the impassioned words from Angelo of - “You’re blowing it now son, you’re blowing it”? The power of such a motivational speech cannot be underestimated. Indeed, in an interview this writer was fortunate enough to have had with Sugar Ray earlier this year, the former multi-weight king had nothing but good things to say about his former trainer/corner-man. Angelo Dundee is 90 on Tuesday. The man whose name is forever bracketed with the legend he helped make The Greatest is still in there punching; or rather, showing others how. 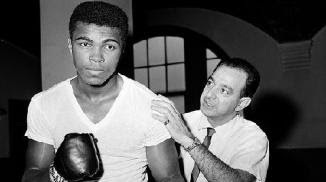 The old master's pupils may no longer be world champions such as Muhammad Ali, Sugar Ray Leonard, Willie Pastrano, Jose Napoles , Carmen Basilio and the host of others – 15 in all – he schooled in his 50 years as boxing's supreme Svengali, but the squad of young hopefuls now under his inimitable tutelage receive the same care and sage advice he gave the fight game's finest. "Thank God I'm in good health," he told me from his home in Clearwater, Florida. "I've got a new hip but otherwise I'm OK and keeping as busy as I want to be."